I don't know about you, but there is no way I can trust my three year old in an art museum. I can just picture the look on the gallery guard's face as my little one runs full force, palms out ready to touch a Seurat, Degas or O'Keefe. But, I love art and am eager to introduce it to my son without the use of creepy Baby Einstein DVDs. So, I use my art coffee table books, scanner and a little patience to help him recreate the masterpieces of the great artists of our time. Begin by letting your child pick out the painting they want to reproduce. You can flip through an art book or go on a website. Whatever the source, make sure you can print out the picture. 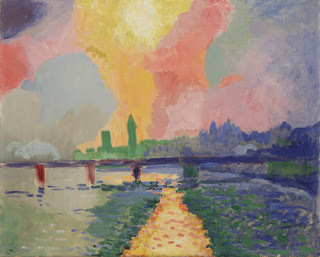 My son chose "Charing Cross Bridge" by Andre Derain. I made a color copy, cut it out and taped it in the top corner of his easel. I then challenged him to paint the same picture. Your child may need some help of where to begin. Start with the most concrete item in the painting. For example, in the above painting, a good place to start would be with the bridge. Then, help your child identify what colors they need, where on the paper they go, what kind of brush stroke to use, etc. Some great vocabulary to use would be directional "top" "bottom" "edge" "corner" or descriptive "dark" "light" "soft" "mixed together". Your child may need a lot of structure and help with this or very little. My guy needed a lot of assistance and patience from me. If copying a painting like this is too hard for your little one, have your child copy something that you have painted. You can even do it side by side. Mom draws a circle - Son draws a circle Mom makes a nose - Son makes a nose, etc. Here is my son's finished Derain. I'm pretty sure that without the original beside it, no one could decipher that this is a picture of a bridge, but that's not the point is it? It's all about the process and our enjoyment together - not the product.